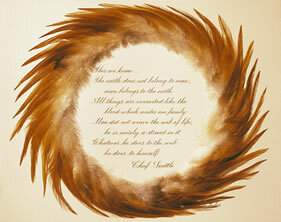 NATIVE AMERICAN QUOTE: Chief Seattle Print: "This we know..."
blood which unites one family. Chief Seattle was a Chief of the Suquamish tribe in the Pacific Northwest in the 1800's. In 1854 he gave a speech to the Government's Indian Superintendent, Isaac Stevens. In 1887, Dr. Henry Smith wrote his recollection of the speech. In 1972 when Ted Perry wrote his version of the speech for a film script about ecology, his words became famous and attributed to Chief Seattle. This quote is a timeless and eloquent expression of our relationship to the earth. by a ring of saddle hackle feathers. Click on the picture above to see an enlarged version.